In the days BB (Before Blogging), I dreaded dreary days. 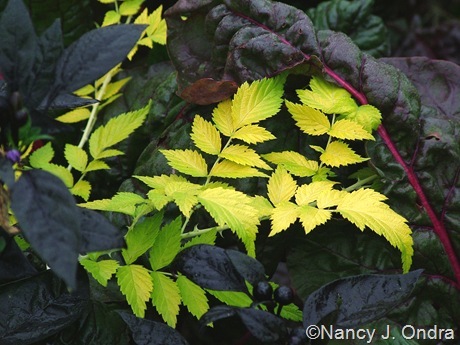 Now, I am very grateful that it has been gloomy and drizzly today, because I’m finally able to finish up my series of posts on some favorite golden foliage, with a sampling of some chartreuse-leaved perennial-ish plants. To start with, here’s one that’s technically a shrub (or sub-shrub) but usually sold as a perennial (hence perennial-ish): Caryopteris. 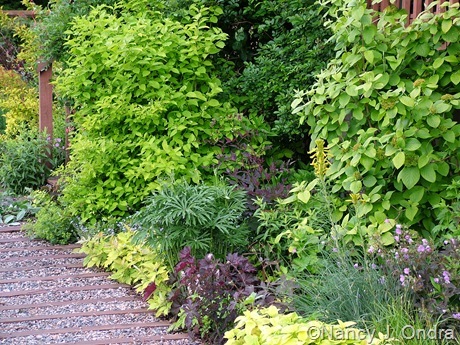 Good grief – more yellow-leaved shrubs? Enough already! Well, no, not quite enough, I think: I have a few more I’d really like to share with you, if you can bear with me. A few days ago, I was beginning to wonder how I was going to fit blogging into my day, with so much to do outdoors. Well, after spending all day cutting down ornamental grasses yesterday, and taking the alpacas for a walk, building a new raised bed out back, and emptying the compost bins today, I am permanently stuck in my desk chair, never to rise again (at least until bedtime). So, I have my answer: I’ll play in the garden until I’m too tired to move, and then I’ll blog. 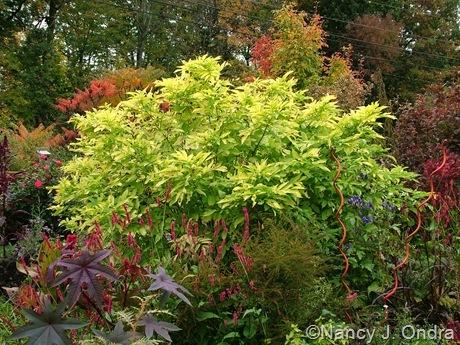 In my last post (Gorgeous Golden Shrubs – Part 1), I started discussing some of my favorite golden shrubs. And oh yes, there are many more. 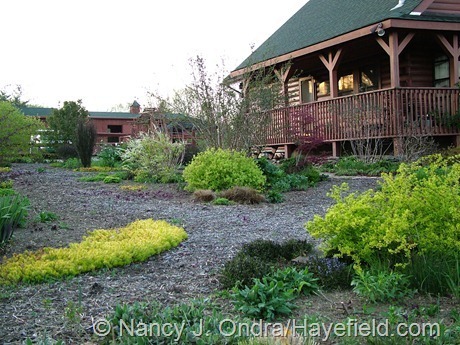 As exciting as it is to see the first few blooms of spring, it’s hard not to be greedy and wish for more color now. Hooray for years’ worth of digital photos to supply a quick color fix! 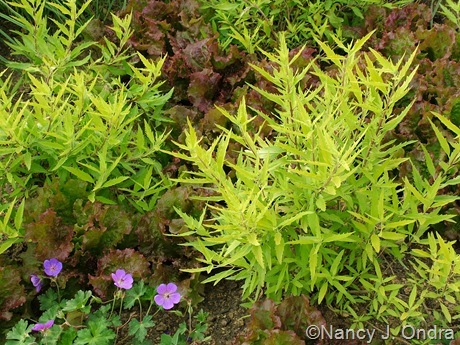 While I was filing some newer images, I came across pictures of some of my favorite yellow-leaved shrubs, and, knowing that many of you too enjoy great-looking foliage, I figured I’d share them. 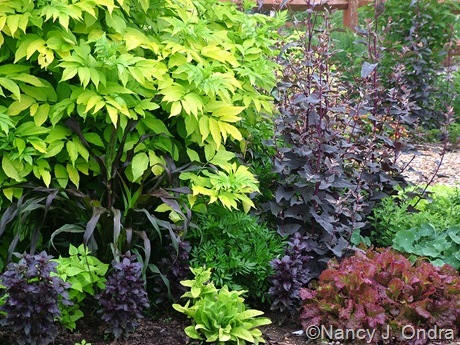 I decided to divide them into two posts: those that are grown for flowers as well as foliage and those prized mostly for their leaves. I promise this is the last post on burgundy and gold – for a while, anyway. (You can find the previous posts in Part 1 and Part 2.) For this one, I’ve pulled a few perennial-based combos. 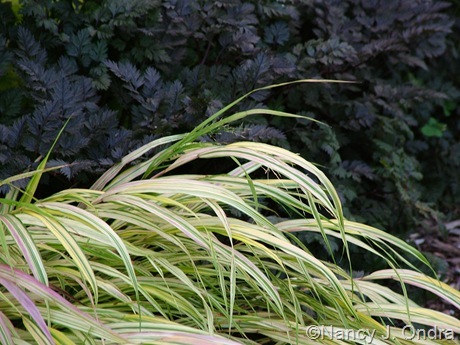 Above is a late-summer view of one of my favorite pairings in what passes for shade in my tree-less garden: golden Hakone grass (Hakonechloa macra ‘Aureola’) with the near-black foliage of ‘Ravenswing’ cow parsley (Anthriscus sylvestris). It’s pretty high-contrast for most of the growing season, but as fall approaches, the grass starts taking on pinkish tinges that softens the effect a bit.